I painted Sekhmet in 1993 for Llewellyn's 1994 Myth & Magic Calendar. She is included in the Goddess Oracle. Once, long ago, the lion-headed sun goddess of Egypt became so disgusted with humanity that she commenced a wholesale slaughter of the race. Her fury terrified even the gods, who deputized Ra to calm down the goddess. She refused to be restrained. "When I slay men," she snarled, "my heart rejoices." Ra, attempting to save the remnant of humanity from the blood-thirsty goddess, mixed 7,000 vats of beer with pomegranate juice. He set the jugs in the path of the murdering lioness, hoping she would mistake them for the human blood she craved. Indeed she did, and she soon drank herself into a stupor. When she awoke, she had no rage left. 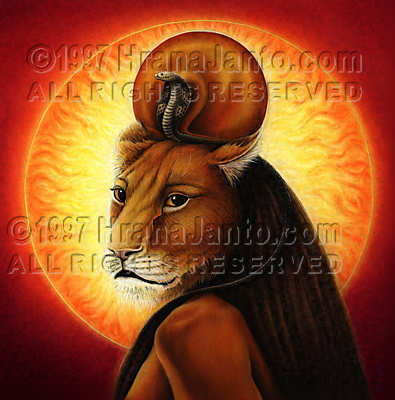 The intoxicating red drink was henceforth prepared and consumed on feast days of Hathor, so some say that Sekhmet was the negative side of that pleasure-ruling goddess. Others say that she was the opposite of the catgoddess Bast, the cat embodying the sun's nurturing rays; the lion, her destructive drought-bringing potential.